When you launch the Payroll application, you see a window much like this. These are the hours and earnings in the current payroll batch. Each line represents hours and wages, also including salary, commissions, and other types. This is the starting point of each payroll. 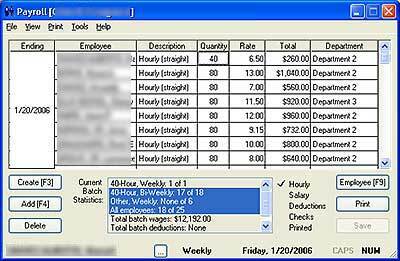 Usually, you start a payroll batch by creating wages for salaried employees and those who work a fixed number of hours in a pay period. Press F3 (or Click Create or select File>Create) to open a window like this. As a default, Payroll will show you all the employees marked for creating wages (either as hourly or salary), grouped by pay period (weekly, bi-weekly, and so on), with all of them checked off. 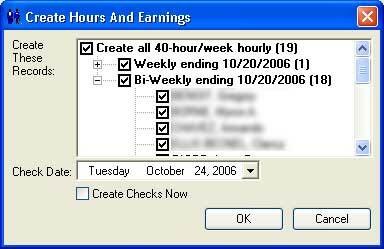 To create wages for all of them, you just click OK. Or, you can check off groups or even individual employees. If all your employees work a fixed number of hours or are salaried, your next step is just creating the checks! To add hourly wages or pay for an individual, press F4 or click Add from the main Payroll window. 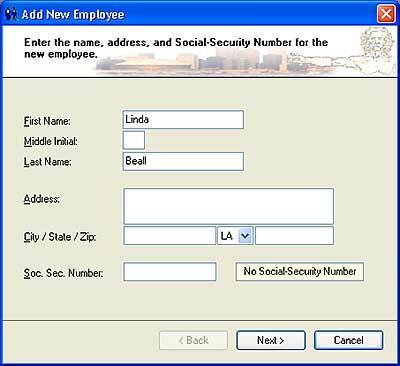 Payroll will prompt you to select an employee, and you'll see a window like this. 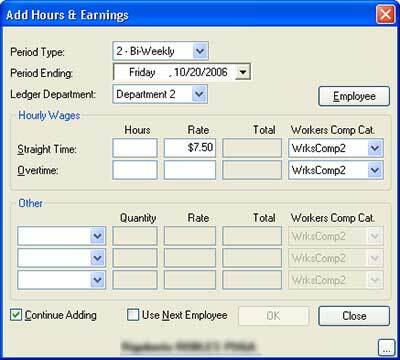 If you set up the employee as "Hourly", the cursor will be in the first "Hours" box next to his or her normal pay rate. Just key in the number of hours. If that's the only work for this employee, just press Enter and move on to the next employee. If you selected a salaried employee, the cursor will be in the "Salary" box like this. Just press Enter to accept the normal salary for this pay period or change it. Again, you can just press Enter and move on to the next employee. We won't go into all the payroll steps here. We just wanted to give you an idea how quickly you can create a batch of hours and earnings -- and that's the only manual part. Next you print an Hours & Earnings List, as a paper trail and edit listing for the batch; print a Check Register (which shows all the withholding and deductions) and the checks; and, finally, process the batch into employee tax records. Payroll couldn't be much easier! The "Tax Table" tab at File>Settings looks exactly like the pages of your IRS Circular. Just fill in the values from the appropriate table. Or, you can download them from this web site. Our payroll application will fit virtually any checks! 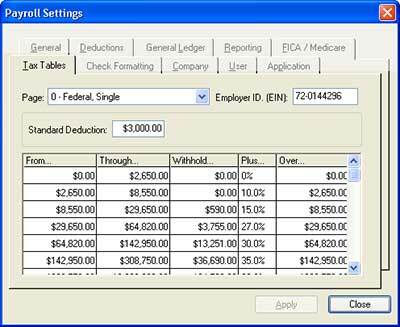 You can even use the same checks for payroll and vendors. We use a familiar Windows "wizard" routine for adding new new employees. This greatly streamlines the setting of the parameters necessary to generate an employee's first check. You can do it in the middle of a payroll batch!